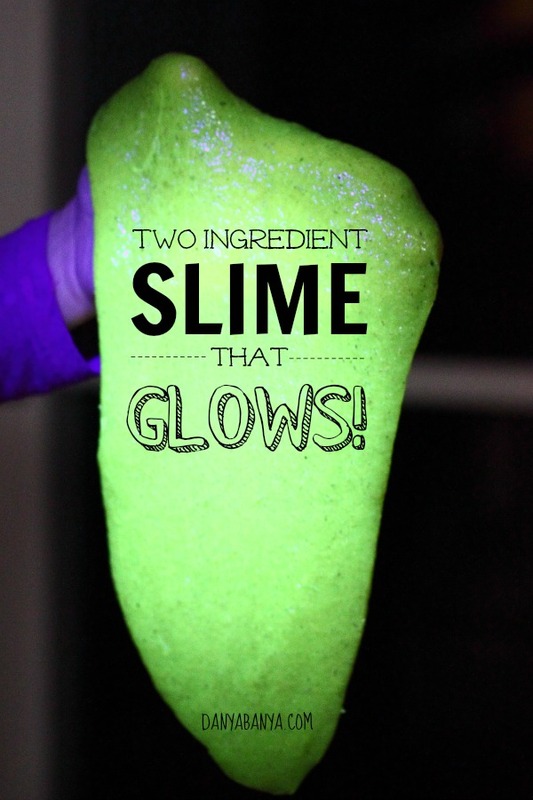 How to make slime that GLOWS – fun science and sensory play for kids. 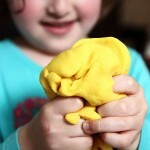 Check out this slime that I made for my toddler and preschool aged girls to play with. Awesome, huh? 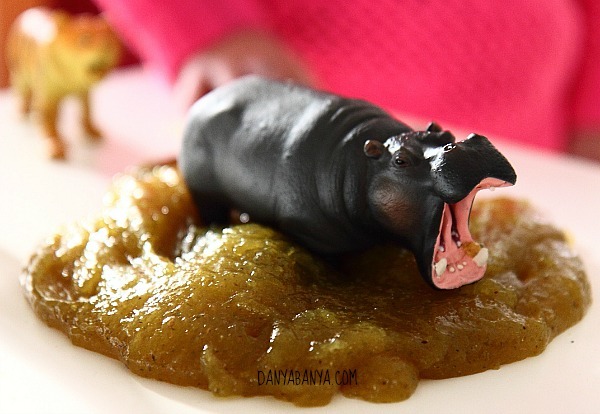 Just perfect for their hippo to wallow in. 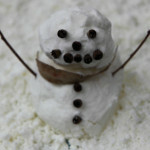 Can you believe it’s made from just two ingredients (plus water, but that doesn’t count), is Borax-free and non-toxic? 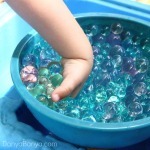 You can squish it, pick it up and tear it apart and it doesn’t stick to your hands (or the table, or your toys). But I haven’t even got to the best part yet. You see, it also glows. 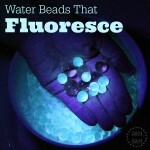 You do need a black light (ultraviolet light) for the glowing effect. We have a black light torch, like this one . 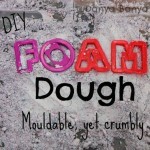 Want to know how to make some? 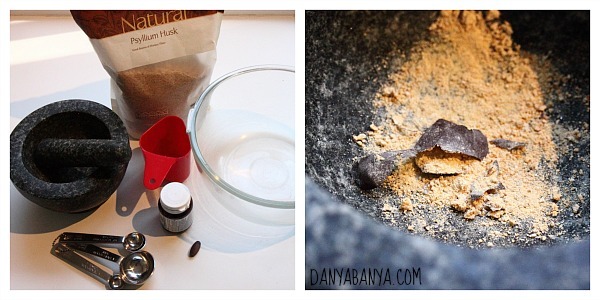 The base ingredient is psyllium husks. 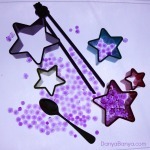 But you only use a tablespoon at a time, and we somehow bought a massive bag of psyllium husks (similar to this one) that will probably last us for decades, so I’d been toying around with the idea of a type of psyllium husk sensory jelly / slime / flubber for the kids to play with. Gross and awesome at the same time. 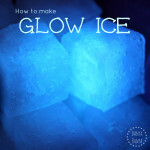 If you are interested in the fluorescent science behind this activity, pop over to read our full fluorescent slime post on our sister site, Go Science Girls. 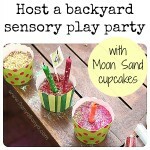 And are you following us on Pinterest? We pin lots of great ideas over there as well. 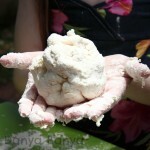 Visit Danya Banya | Go Science Girls’s profile on Pinterest. 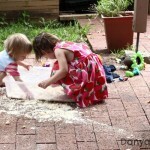 Follow Danya Banya | Go Science Girls’s board Messy & Sensory Play on Pinterest. * This post contains Amazon affiliate links. An affiliate link means I may earn a commission if you make a purchase through my link, without any extra cost to you. It helps to keep this little blog afloat. Thanks for your support. WOW! This looks so awesome. I don't think I've even heard of psyllium husks! Can't wait to try this. Thanks Kate! They are the main ingredient that's in fibre supplements (like metamucil). 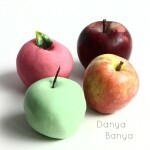 This is outrageously cool, Danya! You're the Art Girl! Bravo! Just a bit cool, what kid wouldn't like playing with that slime! Very interesting about the psyllium husks and making sauces too. Very cool! Gotta get me a black light! This is an amazing idea. Just wanted to check how long does the slime last? Thank you! 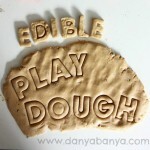 It definitely lasts a few days as the kids played with it for several days in a row. It wouldn't last much longer than this though. Great idea… This is definitely cool. This is GREAT! Where can one buy psyllium husks? Thanks! I bought ours from the health food aisle of our local supermarket, but I’m sure you could get them from health food shops as well. If you dont mind it not being fluorescent can you leave out the vitamins? Yes, it works without the vitamins, but it just won’t glow.